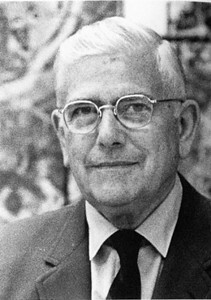 Principal architect of the 1962 Seattle World’s Fair, Paul Thiry introduced European modernism to the Pacific Northwest. His notable buildings include The Washington State Library in Olympia and the Frye Art Museum in Seattle. Thiry co-authored a major book on modern religious architecture, and also served on local, regional, and national planning commissions. Born in Nome, Alaska, in 1904, Thiry’s early education began at Saint Martin’s, a Benedictine School near Olympia. He entered the University of Washington intending to study medicine. In 1928, he graduated with a degree in architecture. His early work had much in common with other local residential architecture. His 1928-1929 Lakecrest Apartment Court looked to historical precedent for details, massing (volumes and proportions), and use of materials. His education at the University of Washington followed traditional Beaux Arts principles. Many of the United States’ most prominent architects of the late-nineteenth and early-twentieth century were trained at the Ecole des Beaux-Arts in Paris. In the late nineteenth century, this highly regarded Parisian architectural program aided the professionalization of architecture in the United States. The school or ecole imposed a structured program on its design students, assigning them studios in which less experienced students assisted their upperclassman. Historical models informed details and styles. The primary theories promoted by the Ecole curriculum also determined proper floor plans. When commissions were low during the Depression, Thiry toured Europe where he met influential proponents of the avant-garde including Charles-Edouard le Corbusier (1887-1966). The European moderns like Corbusier questioned the rules of the Ecole. Corbusier’s designs and writings were immensely influential, forming the foundation of the modern design movement. In their works, the moderns embraced and incorporated rapidly changing modern life and new technology. Paul Thiry never looked back. Upon returning to Seattle, he redesigned his own house. Its white stuccoed rectalinear surfaces, multi-pane continuous window, and strong horizontal axis stood in stark contrast to contemporary Seattle houses. Although Seattlites would eventual embrace modern house design, Thiry’s first effort met with resistance. In subsequent works, he tempered the “pure” modernist style with regional elements such as sloping rooflines and wooden cladding. While his architectural practice flourished, Thiry began work on planning commissions. From 1952 to 1961, Thiry was a member of the Seattle Planning Commission. Between 1954 and 1957, he was also a member of the executive committee of the Puget Sound Regional Planning Council. At the same time, he served as an advisory member of the Washington State Joint Committee, which focused on the government of urban areas. Thiry’s work with the Century 21 Exposition (1957-1962), Seattle's World's Fair, combined his planning interests with architecture. He designed a number of buildings for the world’s fair, and contributed site planning and administration critical to the execution of the extensive project. He was fair's principal architect. When the Exposition was complete, Thiry took his planning expertise to Washington, D.C. There, he played key roles in the preservation and planning of the city and the Capitol Building. In 1963, Thiry was appointed to the National Capital Planning Commission, which drew up and executed comprehensive Capital City plans. In 1962, while engaging in this nationally significant work, Thiry consulted on the Montana Libby Dam Project. He created a comprehensive plan and design for the extensive operation. In 1984 he received the the AIA Seattle Medal Honor Award from the American Institute of Architects Seattle. The AIA Seattle Medal, the highest award that AIA Seattle can confer on one of its own Members, and recognizes distinguished lifetime achievement in architecture including design and professional practice and service to the profession, the community, education, and the arts. Thiry worked rigorously until the late 1980s, continuously experimenting with materials and building technology. In 1993, he died of congestive heart failure after years of public service to the Pacific Northwest and the nation.